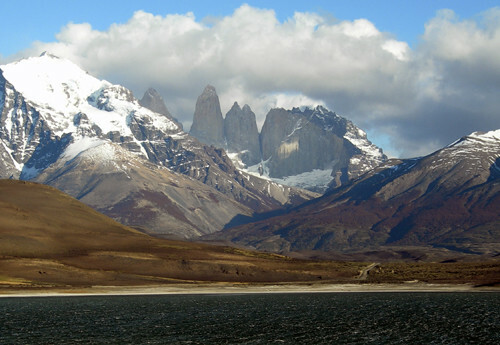 I arrived in Puerto Natales, Chile, which is the closest town to the renowned Torres del Paine National Park which is also an UNESCO Biosphere Reserve. It was the beginning of low season (which brings rain, snow and cold) and the town was virtually void of tourism activities. I managed to get only limited and sketchy information on the park. I made a bold and determined decision to go camping alone when I couldn’t find anyone leaving for the park after 2 days of searching. With only a small number of visitors in the park at this time of the year and without solo camping experience in alpine weather and terrain, the only comfort I had was the fact that the locals weren’t throwing themselves at me to stop me from going and that I did see a few people come back from the park recently. They all wished me lots of good luck which was actually unsettling. I was woken up well before sunrise by a fearsome thunderstorm pounding rain against my window. I was worried and doubted my ride would come to pick me up allowing people to leave for the mountains in this kind of weather. But while I was having breakfast, the sky miraculously cleared. Surprisingly, the minibus was full. Everyone was fully geared up in proper thick waterproof trekking gear, unlike me in my casual backpacker outfit. And the sight of snowcapped mountains also made me realise my preparations for this trip had been far from ideal. We spotted some condors, guanacos and a ñandú (‘roadrunner’) on the way. 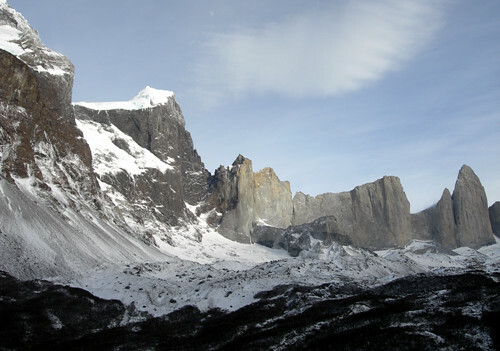 Then, there was the first view of Las Torres (The Towers), one of the distinctive landmarks of the park. It was a moment another travelling dream of mine was coming true. My plan was to spend 3 days in the park to walk just the eastern ‘V’ part of the popular ‘W’ trail, and focus on seeing the peaks the park is mostly famous for. I got a catamaran across Lake Pehoe to my starting point of Refugio Paine Grande (Paine Grande Refuge). When I arrived at the pier, there was a queue of visibly battered and starved trekkers eagerly awaiting for the catamaran to get them out of the park. I felt like a replacement troop being shipped out to a battlefield, still in clean uniform and not understanding the true extent of the dangers ahead. Feeling uplifted by the fairly sunny day, I extended my plan by a day to seeing the entire ‘W’ in 4 days, and headed towards Glaciar Grey (Grey Glacier) on the top left hand side of the ‘W’. I knew I’d be short on supplies and time, but if the weather held up for the duration of my trip it would be worth the sacrifice. There was a fantastic view from the viewpoint half way to Glaciar Grey, of a curtain of rain along a mountain range on the far side of the glacier. It was like looking into a miniature 3D weather pattern simulation playing out in front of me. Strong gusts made me hop around as if I was moon-walking. Seeing the glacier up close and camping next to it for the night would have been nice, but my priority was seeing as much of the peaks. So I went back to my starting point then pushed on to Campamento Italiano (Italian Camp) in the middle of the ‘W’. 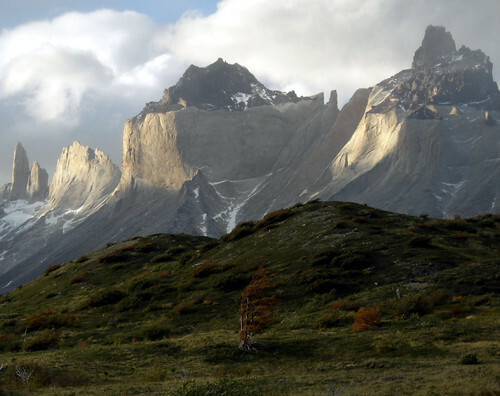 Beautiful and striking views of the aptly named Los Cuernos (The Horns) on the way. I felt peaceful and one with the nature, and passed only 5 people on the trail the entire day. I pitched my tent as the evening light was fading away at Campamento Italiano situated in the woods wedged in Valle del Francés (French Valley). As I lay cocooned in the sleeping bag, I was surrounded by the eternal darkness, sound of crashing river and hissing wind. The dome of the tent added to the surreal sensation of me floating in the middle of a dark space, suspended only by exaggerated noises from outside. They were close yet you had no way of seeing or knowing what was lurking out there. It was something of a mixed blessing that mice started creeping in under the top cover of the tent looking for food, and distracted me from my wild train of imagination. Repacking my backpack and putting away all the smell of food and rubbish quietened them down just enough for me to drift away to deep sleep. I was up early but it rained all day. No point in climbing the mountain in this weather. It now meant staying 5 days instead of original 3 in the park and tightening up on my rationing even more. A beautiful blue sky morning. Not cold at all. I climbed deeper into Valle del Francés (French Valley) and arrived at the viewpoint which was a huge rock conveniently situated in the middle of the valley. Standing on top of the rock, you had a 360° view of the magnificent vertical peaks that have toughened out everything the elements have thrown at them for millennia. I climbed further beyond the trail, through knee-deep snow and dense bush, up to an elevation where the terrain suddenly changed and was covered in rocks and debris that had fallen from the cliffs. The ominous grey clouds slowly closed in and gushes of wind and snow blasted me. Back at the camp, I ate my meagre meal ration for dinner. I was up at 6:30 a.m. It had been raining all night and there was no sign of it stopping. The tent floor was wet and my feet were cold. I packed up and decided to give Campamento Torres a go despite the prospect of 9 ½ hours of walking in the rain and pitching tent in the dark, and I still had to contend with the uncertainty of tomorrow’s weather. 5 other people at the campsite decided to leave the park. What was to follow was probably the most challenging day I have had to endure in all of my travelling. Soon I was treading in a stream the overnight rain had turned the trail into. Some parts of the trail were quite steep and the topsoil had been washed away leaving a deep channel. By the time I reached Albergue Los Cuernos (Los Cuernos Hostel) 2 ¼ hours later, I was totally drenched and suffering from minor hypothermia. I tried to get senses back in my trembling body and hands by warming up over the cooker flame. There remained just one more thing I wanted to see before leaving the park – Las Torres up close. But after about 30 minutes of agonising under the roof overhang, I made the critical decision to leave the park. So after collecting my beat body and mustering enough courage, I took the first step back into the rain. There was no turning back now. I ran with my backpack laden with heavy wet tent and in my soggy shoes. I had to catch the 3 p.m. bus leaving from the bus stop that was 5 ½ hours away. I had less than 4 hours left till 3 p.m.
Then I ran into my worst fear when I saw a big river just before Hostería Las Torres (Las Torres Lodge). There was no bridge in sight and I was trapped. I took a big risk and picked a spot to cross. I crossed 8 rivers in all that day, 6 without a bridge. Falling in any of these icy swollen rivers would have been disastrous. I completed the 4 hour trail to Hostería Las Torres in 2 hours and 20 minutes. It was a real test of endurance, willpower, and orientation skills. There was no time to worry about little things like blisters opening up and hunger. I was driven by the consequences of failing to make the bus. At Hostería Las Torres, I still needed to walk 1 ½ hours to reach the bus stop and I had 1 hour to do it in. Just as I was about to push myself one last time and start running again, by some miraculous luck, I spotted a shuttle service leaving for the bus stop in 5 minutes. The bus ride back to Puerto Natales was a long and painful one. My body, made worse by inactivity, went rigid and shuddered uncontrollably. Looking back, despite the ordeal and missing out on seeing Las Torres up close, I am glad of the enriching experience. I gave all I had, but in the end the mountains got the better of me. 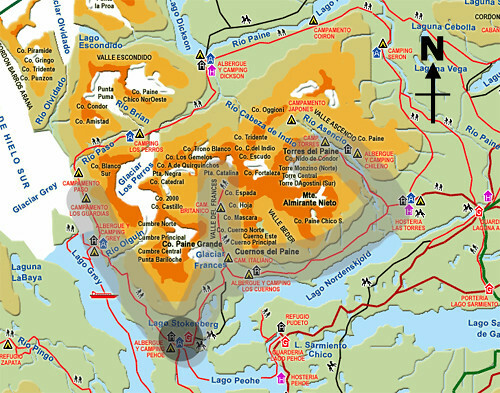 on August 3, 2008 at 11:11 pm Chile » Remote Canada town a hub for Northern Lights Chile tourism.